The Englishman was level with Jason Kokrak at eight under on the 18th but the American made bogey, meaning Casey needed a par four at the last to win. He found a bunker off the tee but hit the green from there and two-putted for a first win since last year's victory. "It feels cool," said Casey, who made bogey on 17 to fall back to eight under alongside Kokrak. "It was messy but this course was so difficult and I did make errors. Looking at 72 holes, it was hard work." Casey's win means European golfers have won the past three PGA Tour events, following Rory McIlroy's victory at the Players Championship and Francesco Molinari's success at the Arnold Palmer Invitational. Oosthuizen finished his round moments before Casey and watched on a greenside monitor. Had Casey not made par on 18, a three-way play-off would have followed but the Briton's smart shot from the sand and excellent putt left him a tap in for victory. Casey, who was one over for his final round, added: "In my mind, it was like I was against the world number one - so beat him and I've got it. It turned out to be a very different scenario and I feel so good right now." 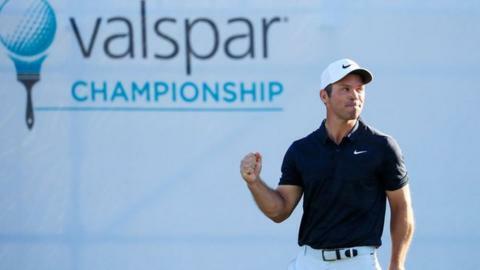 He had waited more than three years for a victory before edging out Tiger Woods and Patrick Reed to take last year's title by a single shot and now has three PGA Tour wins. England's former world number one Luke Donald declared himself "delighted" as he finished tied for ninth on four under, four shots off the pace. But after making eagle on the opening hole to raise hope, he made bogey on holes two and five, before making double-bogey on holes seven and 11 - ending with a two-over-par 73 for the day. "I'm really delighted," said Donald. "It could have gone a bit better today but there were positives. It was a little rust and pressure I hadn't felt in a long time. It's a tough game and it takes time to get back into that groove."